There were so many storylines in the Rockets-Magic showdown Tuesday night. In case you weren’t keeping track, let me recap some of them for you. – The return of Rafer Alston to Houston, and matching up against his former understudy Aaron Brooks and the guy he was traded for – Kyle Lowry. – Yao vs. Dwight Howard (the self-anointed Superman during NBA Slam Dunk competitions), arguably the two best centers in the league. – It was a big game for Orlando since they’re in a neck-and-neck competition for the second seed in the East with Boston. – The Rockets are still in the hunt for home court in the first round of the playoffs. – The return of Carl Landry to the court after recovering from a gunshot wound. Yao Ming won another matchup game against Dwight Howard. 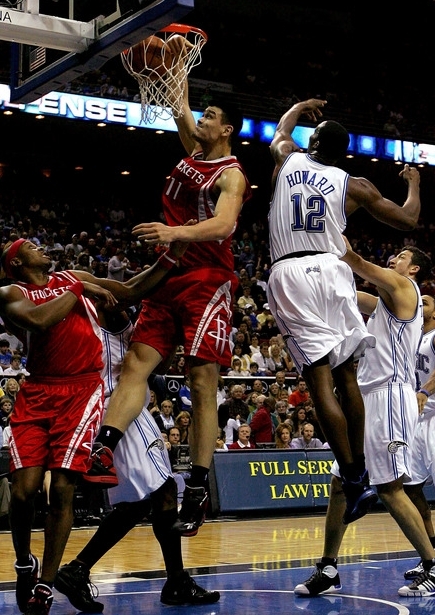 In this photo, Yao is about to block his shot in the first quarter. Click here for pre-game photos of Rafer hugging ex-teammates, and more photos from the game. You have to give credit to the Rockets for winning a 93-83 game against a very good Orlando team, their second big win in a row after beating Portland Sunday night. The Magic have won 57 games this season, which in the tougher Western Conference is probably equivalent to wins in the high 40s like the Rockets. But they still have so many dangerous shooters, and Howard is still Howard. I honestly didn’t know what to expect since I’m still a little bitter the Rockets played poorly down the stretch in Phoenix and LA last week. It’s hard to get over those losses and think the Rockets have addressed their flaws, even after that encouraging win over Portland. This time the Rockets came out strong, just about held the lead the entire game, had a few moments where it got close, like 55-54 in the 3rd quarter. But they would turn it on after that by closing out the quarter on a 12-5 run, and hold the Magic off with another solid 4th quarter, their second good 4th quarter in a row against decent competition. Maybe they’re finally righting the ship after so many implosions most of this year in the 4th. The Rockets’ offense was good, but their defense was even better, holding the Magic 19 points below their scoring average of 102 and to 38% shooting. On offense, the Rockets had only 6 turnovers, the second game in a row where they’ve taken care of the ball fairly well after only turning it over 8 times against Portland. Yao would win the battle against Dwight Howard for the 7th time out of their 9 matchups, scoring 20 points on 8-of-13 FG attempts, grabbing 16 boards, blocking 2 shots, and having NO turnovers. Howard scored 13 points (5-of-11 field goals) grabbed 10 rebounds, had 3 blocks, and 3 turnovers. His making only 3-of-9 free throws didn’t compare to Yao’s 4-of-5 from the line. Tuesday night I came across an interesting analysis on this Orlando Magic fan site of why Howard doesn’t play so well against Yao compared to other NBA centers. It’s pretty good, and hopefully it will be more relevant to all of us in a couple of months if the Rockets and Magic are lucky enough to face each other in June. Yao started off the game strong over Howard with a hook shot him along the baseline, then a couple of minutes later he hit a turnaround jumper over him, and about 3 ½ minutes later scored on another jump hook. Then about 1 ½ minutes later, he would block Howard on a spin move in the paint, which had to surprise him. Yao set the tone early he was ready for the competition. I like it when Yao raises his game to meet the challenge from a dominant big man, like he does for Shaq. One of my favorite Yao plays occurred with just under 2 minutes remaining in the first half when he banged Howard hard for position underneath the offensive glass, snagged the rebound, then pivoted around Howard for a left-handed layup off the glass! Howard was trying to keep from picking up his 3rd foul, so he didn’t really contest the shot, but it was good to see Yao banging hard in the paint for the board. Four of Yao’s 16 rebounds were on the offensive end, a little better ratio than we’ve seen from him this season. The Rockets will need more of that from him. Another favorite play of mine from Yao happened with 3:29 remaining in the game when he dribbled a couple of times way out high, then pulled up and hit a jumper as the shot clock was winding down to make it 84-74 Rockets. That’s a rare move for Yao since normally when he shoots a face-up jumper far away from the basket, he doesn’t dribble at all before launching the shot. This time he did, and it was fun to watch him stop-and-pop. 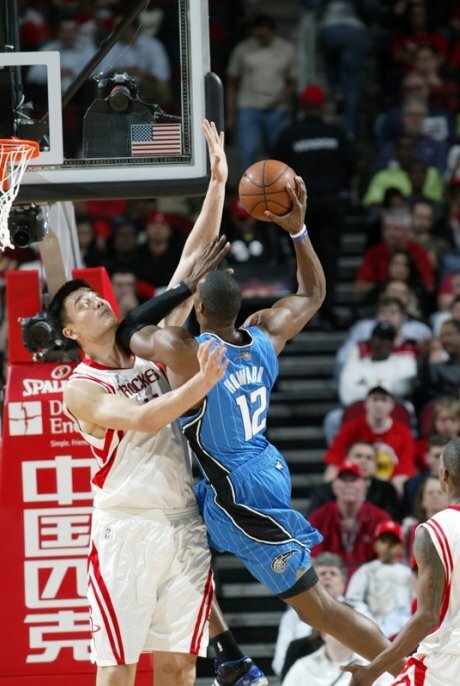 Yao Ming throws down a dunk over Orlando center Dwight Howard Friday night. 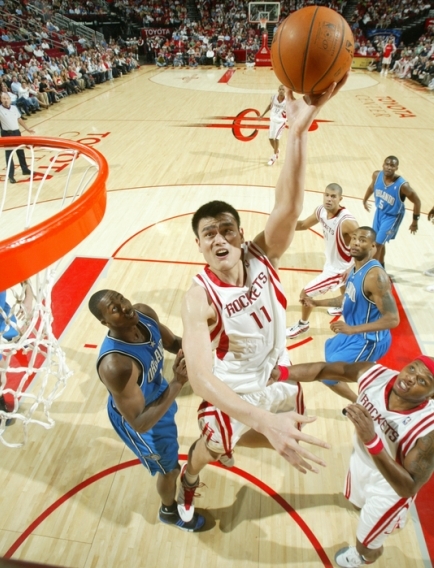 Yao finished with 26 points and 10 rebounds to lead the Rockets to a victory. He had plenty of help though, including Rafer Alston, Aaron Brooks, Luther Head and Luis Scola. Click here for more photos from the game. The Rockets came up with one of their most impressive games of the season, beating the Orlando Magic 96-94 at their “Amway Arena” after losing a heartbreaker against Boston just a couple of nights before. Man, it feels good to write about a win after 2 disappointing losses to Golden State and Boston. I really liked the effort that most of the Rockets gave. You have to give them a lot of credit for their resilience. Orlando is a good team, having a 22-12 record before the game, although they had only won 7-of-14 games at home this season (15-5 on the road). It wasn’t easy, though. The Rockets seemingly had the game well in hand with a 12-point lead in the fourth quarter, but they blew that lead and Orlando tied the game up on a Rashard Lewis 3-pointer with 19.9 seconds remaining. That’s when Rafer Alston probably had his biggest play in ages, penetrating into the lane and scoring on a tough left-handed layup for a two-point lead. The Magic almost tied it up when Adonal Foyle tipped the ball in at the buzzer after a Rashard Lewis miss, but the replay showed that the ball left Foyle’s hand about a millisecond too late. It was the correct call by the officials. Congrats to the refs! (You don’t hear me say that phrase too often). It was a team effort for the Rockets, with players like Big Yao scoring 26 points and grabbing 10 boards in playing well against his new rival, Dwight Howard, who only scored 16 points and grabbed 8 boards before fouling out. Alston probably had his best game offensively, scoring 20 points on 7-of-14 shooting, including 3-of-4 three-pointers, and had 8 assists. He had lots of problems defensively, which I’ll get into later. Yao Ming shoots a jump hook in the lane against Orlando on Wednesday, December 19th. Yao finished with 19 points and 17 boards in a game where the Rockets shot 34% as a team and lost 97-92. Click here for more photos from the game. Click here for photos from the pre-game shootaround where former assistant coach Patrick Ewing paid a visit. At first I was upset how the Rockets couldn’t make a shot and blew an early 16-5 lead to let a struggling Orlando team beat them 97-92 Wednesday night. This is a Magic team that had lost 5 of their last 6 games, and in their past 7 games their defense was atrocious, giving up a whopping 107.3 points per game. So their coming to Houston was just what the doctor ordered, with Houston hitting only 28% of their shots by halftime, 34% overall, and scoring 15 points on average below everyone else who has played Orlando the past 7 games. But now that I’m a realist and have come to the conclusion that this Rockets team is going to be mediocre for awhile, it’s time to start thinking how the Rockets can salvage this season. Forget about going deep in the playoffs. For me, the goal for this team is to make a late, strong run to get at least the 8th playoff seed, get their offense humming, their defense back to par, and then acquire a few key pieces in the off-season to make a stronger push next season. If Yao Ming was looking to get accustomed to intense road games again on the Rockets’ road trip, he certainly succeeded with their game on Sunday. A couple of days after getting upset in Atlanta, I was afraid it could happen again in Orlando…and it almost happened. The Rockets had a comfortable lead cut to only two points late in the fourth quarter when they couldn’t score for about five minutes of play, but Luther Head hit a big three-pointer off a T-Mac assist, and then T-Mac hit a big jumper himself with about 30 seconds remaining to help hold off the Magic 97-93. McGrady scored 34 points, which included 15-of-18 free throws, 3-of-6 three-pointers, and 6 assists. Rafer Alston continued to shoot unbelievably from behind the arc, hitting 5-of-9 from downtown for 20 points. Luther Head scored 20 points on 5-of-8 shooting, including 3-of-5 treys. And Shane Battier hit 3-of-6 three-pointers (5-of-10 overall) for 14 points. When you add it all up, the Rockets shot an amazing 14-of-27 from three-point land, and all four of the aforementioned players shot 24-of-49 field goals, almost 50%. But the Rockets shot 43.2% as a team. So which players dragged that shooting percentage down? Well, Bonzi Wells only made 3-of-11 shots (and 3-of-6 free throws to boot) and former Magic forward Juwan Howard was 0-for-4. But it didn’t matter as the Rockets got out of O-town with a W, then jumped on a plane headed to Houston for a back-to-back against the 13-42 Celtics, a sure win that even a paranoid fan like me can’t create fear about. Yao contests a shot from Orlando’s Dwight Howard on Sunday afternoon. Yao had another excellent game, scoring 29 points and grabbing 11 rebounds in 34 minutes of play to hold off the Magic 89-84. More analysis of the game is forthcoming late Sunday night. To see more photos from the game, click here. For those NBA fantasy league managers who have Yao on their roster and were hurt earlier this season when he was out 21 games with his toe injury, surgery, and recovery, I have great news for you. You are now being rewarded for your suffering. In the four years I have been running this Web site, I don’t think I have ever seen Yao play so well with such consistency. Yao has had stretches like this previously in his career, only to take a few steps backward. But not this time around, Yao has really hit his stride and is racking up double-doubles consistently. He had another one Sunday afternoon in Orlando, scoring 29 points (15-of-19 from the line, the most makes and attempts this season by a Rocket) and grabbing 11 boards to lead the Rockets to an 89-84 win. You can honestly say that without Yao in the lineup, the Rockets would be losing most of these games. It used to be that’s what you would say about T-Mac. Don’t get me wrong – T-Mac has been very important, but without Yao, the Rockets would not have won 10 of their last 12 games. One of the reasons for Yao’s improvement lately is his ability to stay out of foul trouble. Another is his improved conditioning. It also helps he had more of a physical and mental break this past summer without as many commitments to the Chinese national team. Another is that his toe feels a lot better after finally getting it treated. That was no more evident when he made one of his quickest baseline spin moves this season in the second quarter Sunday, exploding around Tony Battie, leaving him in his wake, then throwing down an authoritative one-handed jam sideways! But the main reason for Yao’s success has to be his increased confidence after seeing how much his team needed him during his 21-game absence. When you realize your team is better with you in the lineup than not, you tend to play a lot looser and relaxed knowing a mistake or two isn’t going to kill your team. In the first half against Orlando, Yao scored 11 points on 3-of-5 shooting, giving the Rockets a 44-39 lead. T-Mac was also a stud in the first half, hitting 5-of-10 shots and scoring 14. But the rest of the way, T-Mac struggled, making only 1-of-6 field goals and scoring 5 points. Yao picked up the slack for T-Mac in the third quarter, scoring 13 points – 7 points coming from the free throw line. Early in the fourth quarter, the Rockets opened up a 20-point lead (74-54), and it looked like the Rockets were going to cruise to an easy victory. But then Orlando went on a 25-8 run – thanks to lots of free throws – and pulled within three points with 1:21 remaining when Hedot Turkoglu hit a three-pointer from the corner to make it 82-79, Houston. But an unlikely hero, Juwan Howard (12 points on 6-of-12 shooting), hit a cold-blooded baseline jumper on the following possession to push Houston’s lead to five points and was able to hold on the rest of the way. I’m not too concerned the Rockets have been blowing big leads lately. If they were leading the Western Conference and were looking to tune every facet of their game for the playoffs, it would be a different story. But the Rockets are just trying to scratch and claw their way into the playoffs, and I will take a ‘W’ any way I can get it. And with the Lakers losing to Boston by one point Sunday night, the Rockets are now only 3 games behind LA for the 8th and final spot in the Western Conference playoffs. Amazing the Rocket have gotten themselves back into the hunt. The only problem is that on Monday night at Toyota Center the Rockets play a back-to-back and face the sizzling Phoenix Suns, winners of 6 games in a row and the team that handed the Rockets their worst loss of the season just 10 days ago, 109-75. Unfortunately, I probably won’t be able to file a report for that game since Monday is my wife’s birthday. For you married guys out there, you know how bad of a move it would be for me to stay home and watch that game versus taking my wife to dinner on such a special day. If history is any indicator, it won’t matter much that I miss that game since it could be over by the third quarter. But just in case they surprise me, I’m going to record it. Yao meets up with old teammate Steve Francis before Tuesday night’s game between the Rockets and Magic. Francis was finally able to get beat his old team since the trade, leading Orlando to a 76-74 victory with 27 points. Without T-Mac, Yao scored 17 points on 6-of-15 shooting. For more photos from the game, click here. TUESDAY, 11/08/05 – With Tracy McGrady out because of a bruised spine, the Rockets are in big trouble. With all the talent on the team, no one thought they would struggle offensively as much as they have their past two games without T-Mac. The Rockets shot poorly again (37%) and lost to a winless Orlando team 74-71 Tuesday night at home. It probably won’t get much better as Houston embarks on a tough 5-game road trip. Maybe a repeat of last year’s 5-11 start could happen again this season? Oh well, if the Astros can start off poorly for the second straight year and still make it to the World Series, they there is still hope for the Rockets to get to the Finals. Yao goes up against Orlando’s Ruben Boumtje-Boumtje Wednesday night in Houston. The Rockets won their second straight preseason game, 84-80. Yao finished with 19 points and 6 rebounds in 22 minutes of play. For more photos from the game, click here. WEDNESDAY, 10/12/05 – The Rockets continued their great preseason form and won their first home court game against the Orlando Magic, 84-80. The result was that Rockets fans left Toyota Center fantasizing about how great this season can be. And all of this without even seeing new power forward Stromile Swift, who still has not made his Rocket debut since coach Jeff Van Gundy decided to rest him to nurse a bruised arm. The match was closely contested from start to finish. Despite Yao picking up an early defensive foul in the first minute of play, he made 2 consecutive hook shots with ease from assists from Derek Anderson and Rafer Alston. Already in the first two preseason games, Alston has made us wonder why it was so difficult for Bob Sura to make entry passes to Yao last season. You are currently browsing the archives for the vs. Orlando category.